Sit by the fireplace with tea, cookies and sweets, surrounded by Christmas cheer, as you see Santa coming down the chimney in this warm and cozy scene by Sandy Orton. 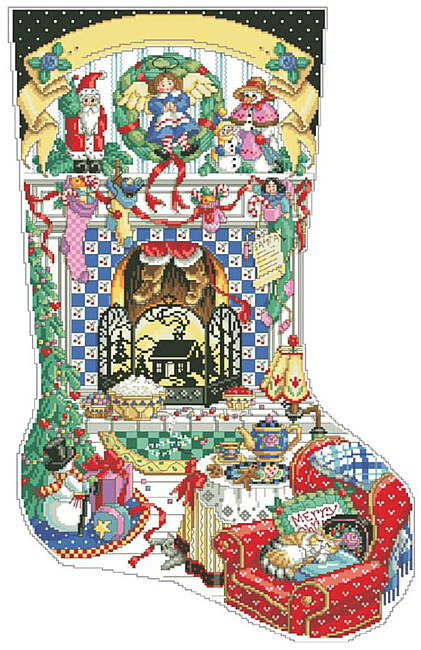 This stocking is our most detailed and largest stocking to date, with 290 stitches deep; it stitches up to almost 21 inches long on 14 count. Personalize this charming classic to be cherished for a lifetime. Contents: Stitch Count 186w X 290h, finished size on 14 count 13-1/4" X 20-5/8"